With summertime in full force, fruits of all varieties beckon from those farmer’s market stands. We’ve already gone strawberry picking and cherry picking, yet I am most excited to see raspberries and blackberries start to ripen in my garden. If I’ve made any impact on your couponing life at all, hopefully you have a few free cake mixes stockpiled in your pantry. If not, now is the time to start looking for some because this recipe will revolutionize any dessert dilemma that comes your way. I will post my easy home made cobbler recipe as well, but this cooking “accident” is the dessert bomb! We constantly have guests coming in and out of our house and often, I need something to serve with no warning. Not only is this dessert really frugal during fruit season, but it’s virtually fat free since I’ve taken out the stick of butter for which most cobbler recipes call. I admit, I was out of butter and that created this butter free option. I love it because I can have large portions with no calorie counting guilt. I know you are all going to want more clarification on this recipe, but seriously, this is all I did and it was DELICIOUS! So, is it really a “recipe?” Not really, but it’s still so good and you don’t have to think, and sometimes we all need a “recipe” like that. Pick your pan size, grease the bottom and then fill the bottom of your pan with fruit (approximately 24 ounces if using frozen or canned for 9×13). Since we have a large family, I use a 9×12, but that takes tons of fruit. After strawberry picking, I had enough strawberries, but threw in a few miscellaneous blackberries and blueberries for good measure. Since then, I’ve made this many times by mixing tons of fruit so that I had enough. I’ve mixed strawberries, cherries and apples together and it was wonderful. Sprinkle yellow or white box cake mix over the top of the fruit until it’s fully covered. Then add pour one can of Diet Sprite right over the top. Do not stir, but make sure you’ve covered the dry cake mix. A quick and easy one minute “recipe”?? Empty your choice of fruit into the bottom of one 9×13 inch pan. Cover fruit with the dry cake mix. If using soda, just slowly pour sprite or 7 up over the cake mix. If using butter, pour melted butter over top of cake mix. This sounds like a winner! Delicious, easy, and lower cal. Is it possible? I am going to try it this week! Thanks for the idea! I have made this with canned fruit and the stick of butter in the cake mix, but I am going to try it the healthier way next time!! thanks! I’m so gonna try this. Thank so much. 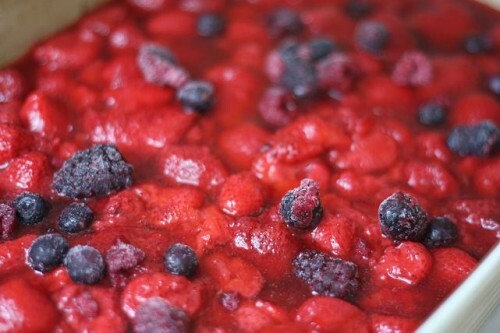 I keep frozen berries on hand year-round for this! But I sprinkle about 1/2 c brown sugar over the cake mix and drizzle about 1/2 c butter over that. Try a cup of water, rubarb, a box of strawberry jello and a whole cake mix. layer them in that order and bake at 350 until the top is brown and it isn’t too liquidy. Love it! Hi, I have done a version of this for years. I use peaches but have used other fruits. I do use the butter and I also include sliced almonds on top. It is yummy and it’s great for breakfast. Great idea! I think cake mix tastes great on it’s own, so I’ve no doubt this will work really well. Folks, I can testify that I made this just a bit ago for my family and it is AWESOME! I love the variations that people have posted. We used 1.5 pints of blueberries in a 9×9 and roughly 1/2 box of cake mix. I’m going to raise my hand with probably a dumb question (not so much sleep with the babies last night …. yep I’ll blame it on that ;). Do you sprinkle on just the dry cake mix or the prepared cake mix – with the water and oil? I just did dry cake mix…..literally, just the 2 ingredients of fruit and cake mix. 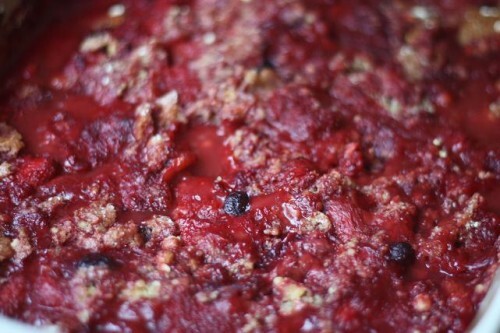 How about if you are using frozen berries? Do you need to adjust the cook time or temp? That looks so good! So easy, even I can do it. I can’t wait to try it. It may take longer than one minute, but not much longer! Wow, that sounds soooo good. And one thing we always have in the house is fruit. I will be trying this tomorrow! ok, I am definitely making this over the weekend. I’ve done this several times with the butter but never thought to leave the butter out. Anxious to try a healthier version! This is absolute best with purple plums, a perfect marriage of flavors, and the carmelized juice is Heaven. I have to admit I use the butter, but I might try without if I can bring myself to risk the Oregon plums I order online to experiment. Do you prepare the CAKE MIX according to the directions on the box or just just the mix alone?? I just made this with fresh cherries, some stawnerries and blueberries. I used a 9×13 and sprinkled with orange flavored cake mix. I hope it is as good as it smells! Let me know. How could it not possibly be good with all that yumminess. Put a dab of whip cream or ice cream on it and it’ll be great to go. Stupid question here. I want to try this with a bunch of fresh pears I have but I was worried they wouldn’t do as well because of lack of juiciness. Other recipes I’ve seen say to mix the pears with sugar and let them sit for awhile which I assume helps them break down so they cook better as well as sweetening them. I’m afraid if I add the sugar with this recipe it’ll be too sweet and if I don’t they won’t cook right. Any suggestions? Yes, sorry. The ease of this is that you don’t mix it according to box directions. You literally just use the cake mix and fruit without any additional ingredients. Sorry about that. Hope it was still good enough to eat with a little ice cream. how many calories is in this recipe? and we will limit our portion size. fruit calories are printed on the can, soda calories are on the label. 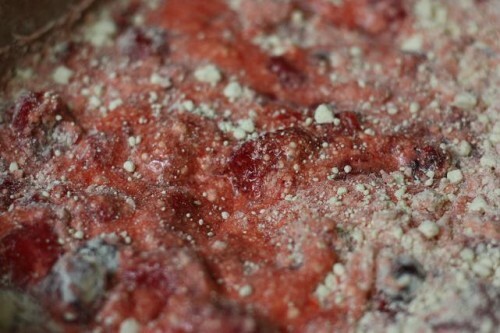 I use frozen berries (normally black berries) and either white or coconut cake mix. Sprinkle over the top and then I pour one can of either Sprite or Diet Sprite over it all. My son LOVES it!! I know this listing is old so I hope you will still answer. This sounds great. I have a party next Thursday and didn’t know what to serve. So, my question is, how do you serve it? Do you flip the entire cake onto another pan or do you just sort of scoop it out from the pan? What is the consistency after baking? Could Angel Food cake mix be used for this “recipe”? just before cobbler is ready, I sprinkle dessicated coconut on top and leave it baking for about 5 minutes ’til coconut has turned golden. Looks good and tastes terrific. I have made this many times and friends and family are amazed at the recipe. COULD YOU SUSTITUTE APPLE SAUCE SRINKLERD ON TOP RANDOMLY INSTEAD OF BUTTER?